More computers are being made green today than ever before and while this is definitely good news, it can be tricky to wade through all of your options. With computers it can also be hard to compare one eco model to another since often the green qualities vary greatly. For instance, is a computer with low mercury content more or less green than a computer made from a high percentage of recycled materials? The answer lies in which computer is the more suitable to your needs. There are a lot of factors to consider when determining the computer that is the right fit for you and eco qualities is just part of the equation. If you are wondering which computer to choose that will be the greenest and deliver the most eco-friendly benefits, we’ve rounded up five green computers (in no particular order) and some shopping tips to help you out. The Sony Vaio W series boasts a compact size and an impressive battery life, but what really sets it apart from the pack when it comes to being eco-friendly is the fact that over 80 percent of the plastic components are made from recycled material and the LED display is a stunning 100 percent mercury free. Apple scores very well in many categories and it turns out green-ness is one of them. The Apple MacBook Pro is extremely energy efficient, largely toxin-free, and it is easy to recycle, making it a very eco-friendly option in computers. Dell’s Studio Hybrid is a compact desktop that comes in 80 percent smaller and uses 70 percent less power than a conventional desktop. The small footprint makes it great for a work area with limited space, but the energy efficiency makes it a green way to take care of business. The Gateway EC19C-A52C/S laptop packs a powerful punch in terms of processing speed, RAM and hard drive sizes, and running such a network of features typically drains a lot of power, but the EC19C series does it all while managing power like a pro. This laptop delivers an impressive 6 hours per battery charge while also offering a host of powerful features. 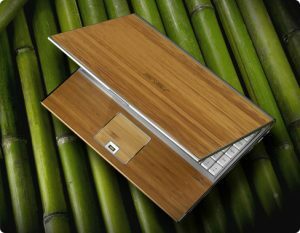 ASUS features two laptops from the [Natur.e] series – the U6V and the U2E that feature bamboo covers instead of plastic. ASUS as a company strives to be as eco=friendly as possible and all of their laptops rank well in terms of energy efficiency, but utilizing sustainable materials for the cover instead of plastic is an ingenious way to up the green factor, plus it looks amazing. Other Factors to Consider When Choosing an Eco-Friendly Computer? A reliable mark to look at when shopping for a computer is the EPEAT (Electronic Product Environmental Assessment Tool) rating. This tool is a quantifying system that assigns bronze, silver or gold ratings based on the environmental impact of a product. It is worth noting that a product with a gold EPEAT rating can still contain toxic chemicals, but overall it is still an eco-friendly choice in computers. A refurbished computer could also be the way to go. 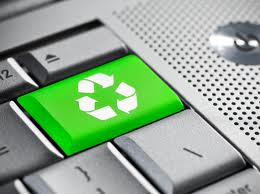 Refurbished computers extend the life of existing products, making them a great, eco-friendly computer option. Also remember when your old computer just isn’t working out anymore don’t toss it in the trash – recycle it. Recycling electronics is easier now than it has even been. Responsibly disposing of your old electronics has a major environmental impact and should not be underestimated. We do our best here at Factory Direct Promos to help consumers and businesses go green with their promotional products and we applaud these company’s efforts to create more sustainable products as well. To see how we build sustainability into our products, please take a look at our complete line of eco-friendly promotional items HERE to help market brands, businesses, and events in a greener way than traditional promotional products.